Best selling author, sought-after speaker, entrepreneur, impresario, world-traveler, and Reality Networker: these are just a few words that describe the life that Tim Houston has led (so far). Tim owned and operated three successful businesses by the time he was 25. For more than a decade, he has dedicated himself to helping businesses of all sizes to become more productive, profitable and prosperous through referral-based marketing and business and social networking. Crowned “The Czar of Networking” by CBS Radio, Tim has positively impacted thousands of business people through his high-energy workshops, motivational presentations, and mentoring sessions on strategic business networking, public speaking, and word-of-mouth marketing strategies, across the United States. He has made more than 4,000 presentations to companies and organizations in the past 13 years. As an author, his first book, The World’s Worst Networker: Lessons Learned By The Best From The Absolute Worst! reached #3 on the Amazon Business Best Seller List in the Sales & Selling category. He is a contributing author, along with Dr. Ivan Misner, Bob Burg, Jack Canfield, Brian Tracy, Tom Hopkins, Zig Ziglar, Martha Stewart Jay Conrad Levinson, Tony Robbins, Harvey Mackay and Keith Ferrazzi of The New York Times Best Seller and multiple #1 Best Seller, Masters of Sales. (Entrepreneur Press, 2007). Tim’s articles on the topic of business networking and word-of-mouth marketing have been translated and published in magazines, newspapers and blogs around the world. Over the years, Tim has been interviewed on many local TV and radio shows and has been featured in many articles including The New York Times, The New York Post, and New York Daily News. Tim is the Area Director for the New York City Outer Boroughs Region of BNI, the world’s largest business networking organization and is the Executive Chair of the Entrepreneurial Excellence Business Forum in Manhattan. Tim loves to travel and has been to 20 countries and 35 US States. He’s also an amateur magician, has two dogs, a cat, a bird and a fish. He is a graduate of Fordham University. His secret to success is his commitment to help others become more productive, profitable, and prosperous in their businesses and their lives. 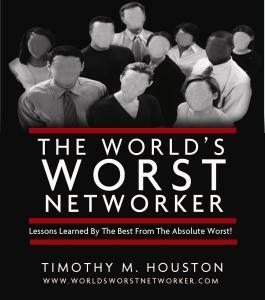 Visit www.worldsworstnetworker.com and www.tmhouston.com to keep up-to-date about Tim’s books, programs and seminars.